Key concept - Change- How do the compositions of solution relate to their properties? For this reason we must have a good understanding of different ways of representing the number of solute and solvent particles present. These representations are called concentrations. Concentrations are used to describe how much of a solute is present compared with the amount of solvent or solution. We will see 4 units of concentration used in the topic of colligative properties (and some variations using these units). Definition: Properties that only depend on the amount of solute dissolved. It does not depend on the type of substance. For a liquid to boil, the vapour pressure of the liquid must overcome the external air pressure. When this happen it allows all molecules in the liquid to vaporize and hence, we see bubbles. When a liquid has not reached its boiling point, the vapour pressure is lower than the external pressure. This means the external pressure is able to keep the liquid in the liquid state. When heated to the boiling point, the vapour pressure is now greater than the external pressure so is able to overcome it. Therefore all the molecules in the liquid can now turn into a gas. A solution will have a lower vapor pressure than the pure solvent. So more heat will be required to overcome external pressure. So boiling point will always increase when a solute is added. This graph shows the normal boiling point for water (solvent) as a function of molality in solutions containing sucrose (a non-volatile solute). Note that the normal boiling point of water increases as the concentration of sucrose increases. m is the molality of the solute in the solution. Describe the relationship between the boiling point and molaity of the solution. What is the ebullioscopic constant for water? ​When dissolving 5 g of a certain solute in 50 g of water, the resulting solution boils at 100.5 °C. What is the corresponding molecular mass of the solute? ​Extension: Why do we often add salt to water before cooking things? In the opposite manner to boiling point elevation, the freezing point of a solvent will always decrease when we add a solute. 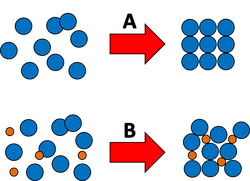 The process of freezing requires particles of a liquid to form a regular structure (as shown in the diagram below). This occurs by removing energy from the particles until they can form this regular structure. With a pure solvent, this process occurs relatively easily as all of the particles are of the same size and shape as each other. However, if we add a solute to the liquid, it becomes more difficult for the particles to form a regular structure and therefore we must cool the solution more than normal (remove more energy) to acheive a solid state. This graph shows the normal freezing point for water (solvent) as a function of molality in solutions containing sucrose (a non-volatile solute). Note that the normal freezing point of water decreases as the concentration of sucrose increases. Calculate how much ethanol (C2H5OH) could be needed per litre of water in order not to freeze above -4.8 °C. When 0.258 g of a molecular compound, benzoic acid, was dissolved in 40.0 g of benzene, the freezing point of the solution was lowered to 5.23 °C. What is the molecular weight of the benzoic acid? Extension: If very cold weather is predicted after a period of wet weather people spread salt (NaCl) on the roads. Why might they do this? IMPORTANT POINT: Why can we use ºC or K with BP elevation and FP depression? ​With the two equations above we are talking not about temperature alone but change in temperature. As the gaps between the units are the same, a change of 10 ºC (for example) is equal to a change of 10 K. This is shown in the diagram to the right where a difference of 100 units is the same in both degrees (0-100 ºC) and kelvin (273-373 K). 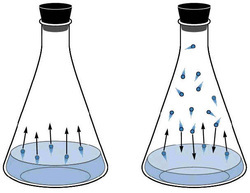 If we take an Erlenmeyer flask with some water and remove all of the air inside, due to the Maxwell-Boltzmann distribution, some molecules of water on the surface will have enough energy to vaporize. The pressure caused by this gas is called vapor pressure. This phenomenon can be explained by the solute particles taking up space on the surface of the liquid. As more solute particles are added, more of the surface is occupied by them and therefore less solvent molecules can vaporise. As discussed in the defintion of colligative properties, it does not matter what the solute is, only the number of moles is important. a) 1 moles sugar in 30 moles water. b) 0.02 moles sugar in 0.06 moles water. I dissolve 1 mol of NaCl, MgCl2 and AlCl3 into 3 seperate beakers with 1 L water. Which solution would have the lowest vapor pressure? Osmosis is the movement of a solvent from an area of a low concentration (solution) to an area of high concentration (solution) through a semi-permeable membrane (that only allows the movement of the solvent). In effect, this process happens until an equal concentration is acheived on each side of the membrane. We can see this process occurring using a simple experiment with eggs. An egg is actually surrounded by 2 layers - the shell, and a semi-permeable membrane. We can use acid to dissolve the shell but it will not dissolve the semi-permeable membrane. 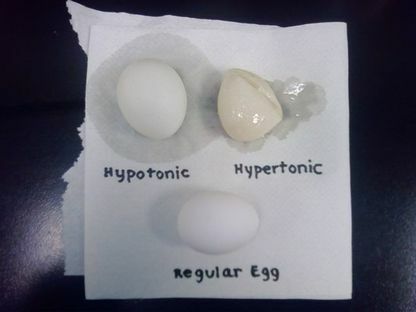 In the distilled water (hypotonic) example, water has passed into the egg as it has a high concentration of solutes. It gets bigger! With the salt water, water has left the egg and moved to the higher concentration of the salt water. It gets smaller! As we know that M = mass (g) / molar mass we can substitute this into the equation to calculate mass or molar mass as well. You will then be able to work through each of the three equations until you get the final result. (You may not need all three). These 2 processes are both types of vaporisation. Occurs at any temperature between freezing point and boiling point because there will always be a small percentage of particles that can overcome to IMFs and vaporise (see below). Occurs at temperatures above the boiling point when all molecules have sufficient energy to overcome IMFs and can all vaporise. Extension: Why might relative evaporation rates be important to know about chemicals in terms of safety? ​Task 4g: Mr Polko´s Mt Everest Challenge!!! Bodner, G. 2014. Colligative Properties. [online] Available at: http://chemed.chem.purdue.edu/genchem/topicreview/bp/ch15/colligative.php[Accessed: 7 Feb 2014]. Teachnlearnchem.com, (2014). [online] Available at: http://www.teachnlearnchem.com/Vapor_2.jpg [Accessed 4 Dec. 2014]. Chem.purdue.edu, (2014). Vapor Pressure. [online] Available at: https://www.chem.purdue.edu/gchelp/liquids/vpress.html [Accessed 5 Dec. 2014]. Chem1.com, (2014). [online] Available at: http://www.chem1.com/acad/webtext/solut/solut-images/raoultmech.png [Accessed 5 Dec. 2014]. Chem.purdue.edu. (2014). Boiling point elevation. [online] Retrieved from: http://www.chem.purdue.edu/gchelp/solutions/eboil.html [Accessed: 8 Feb 2014]. Chem.purdue.edu. (2014). Freezing point depression. [online] Retrieved from: http://www.chem.purdue.edu/gchelp/solutions/freeze.html [Accessed: 8 Feb 2014]. Goldbook.iupac.org. 2014. IUPAC Gold Book - concentration. [online] Available at: http://goldbook.iupac.org/C01222.html [Accessed: 7 Feb 2014]. Goldbook.iupac.org. 2014. IUPAC Gold Book - osmotic pressure, Π. [online] Available at: http://goldbook.iupac.org/O04344.html [Accessed: 7 Feb 2014].